LGA1151 is Intel's newest mainstream socket which replaced LGA1150. Compatible CPUs include Core i3, Core i5 and Core i7. The "Core i7" brand is used to refer to LGA1155/6, LGA1136 or LGA2011 processors so make sure you know which socket type your motherboard has before buying a CPU cooler. If you are wondering what the difference is between LGA1151, LGA1150, LGA1155 and LGA1156, then from a cooler point of view, the answer is nothing. 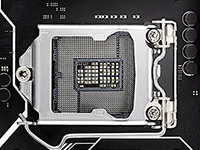 The sockets are mechanically identical so if a cooler will fit LGA1150 then it will also fit LGA1151, LGA1150, LGA1155 and LGA1156, or vice-versa. As always, if you are still unsure which CPU cooler is right for you, please read our article "How do I choose a CPU cooler?" and remember to check the TDP, (i.e. its maximum heat output measured in watts) of your CPU to aid identifying a suitable cooler.